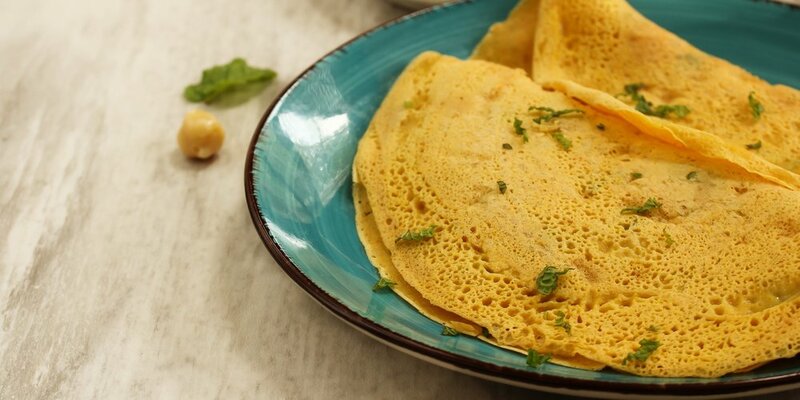 The base of this delicious meal is a gluten-free, garbanzo flour (also known as besan) “tortilla” that is a delicious and healthy supplement to many meals. Not only is it incredibly simple and fast to make, but it is packed with protein and essential nutrients such as fiber, folate, magnesium and manganese. In a large mixing bowl, mix all of the above ingredients well. Let sit 10 minutes. Pour batter (about one ladle-full at a time) into an oiled or nonstick skillet over medium heat. Cook a few minutes each side (until beginning to brown). You can then add the fixings below, depending on your preference or doshic type.